This event is now sold out. Please click 'Sign up now' to add yourself to our waiting list. 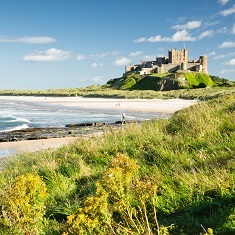 Hike along the breathtaking Northumberland Coast from Alnwick Castle to Bamburgh Castle. to see further Terms and Conditions. The deadline to register for this event is midnight on Friday 21 June 2019 or when the event sells out. We've answered the most common questions below. If you can't see your question here, download our registration factsheet for a full list of FAQs. Click on the Sign Up Now button and complete the online registration form. You will be asked to pay the £25 registration fee and you must pledge to raise a minimum of £250 for Macmillan. We've answered the most common questions below. If you can't see your question here, download our event factsheet for a full list of FAQs. 1. Appoint a Team Captain, they will complete the initial online registration. N.B. the Team Captain will receive essential information about your team registration so must be someone who can easily access their emails and is happy to coordinate the team. 2. Make sure the Team Captain has a list of all the names and email addresses of the people in the team. Once the Team Captain has completed the first online registration, each team member will receive an invitation email to complete their own online registration. 3. On the booking form the Team Captain can pay the registration fee for as many members of the team as they like, or just themselves. If the Team Captain doesn't pay your registration fee, you will be asked to pay this when you complete your own registration form. 4. The Team Captain will choose the start time for the whole team. Make sure you discuss this beforehand and consider the walking pace of the entire group. See our Event FAQs for more details on timings. 5. The Team Captain will also choose their own parking and shuttle arrangements; however, this does not apply to the whole team. Each team member will be asked to choose their personal parking and shuttle arrangements upon registration. 6. Once the Team Captain has completed the team registration, all members of the team will receive an invitation email with a link to their own registration form. 7. Please complete your registration form within two weeks of receiving the email. We only hold the start time for two weeks, so if you miss this deadline you risk starting at a different time to the rest of your team, or losing your place entirely if the event is then full. 8. The Team Captain will receive a confirmation email each time a member of the team completes their registration, which will allow you to monitor who has and has not joined the team. We only hold the team start time for two weeks, so we strongly recommend completing your registration by this deadline. Otherwise, you risk not being able to start with your team and losing your place if the event then becomes full. After this deadline your place in the event is not secure, even if the team captain has paid your registration fee. The final deadline to register is two weeks before the event. However, please note that the event may sell out before this date. There is a discount available for teams of five or more. The discount code will appear on the registration form when the Team Captain registers all members of the team, and needs to be entered in the promotional code box before proceeding to payment. Yes, you will need to raise the minimum fundraising amount of £250 for each member of your team. You can, however, choose to split the total in any way you like between the team if some people are comfortable raising more than others. We've answered the most common questions below. If you can't see your question, download our event factsheet for a full list of FAQs. What date does the Northumberland Coast Mighty Hike take place? The Northumberland Coast Mighty Hike takes place on Saturday 6 July 2019. The hike will start in waves of 250 hikers, 20 minutes apart, between 8:10am and 10:30am. You will be asked to select your start time when you register, and will be available on a first-come, first-served basis. Where does the hike start? The hike starts at Alnwick Castle, Alnwick, NE66 1NQ. You can see the starting point on google maps. Where does the hike finish? The hike finishes at Bamburgh Castle, Bamburgh, NE69 7DF. You can see the finishing point on google maps. What time does the hike finish? We estimate that the fastest walkers will finish in 7.5 hours while the slowest walkers could take around 12.5 hours. Actual finishing times will depend on your start time so please choose this carefully to ensure that everyone has an equal chance to complete the route. If you consider yourself a slower walker please choose an earlier start time and vice versa. For information on travel, public transport links and parking please download the Events FAQ factsheet above. Yes, this is a fully supported event. There will be a full buffet lunch at the half-way stop and hot food at the finish. There will also be regular refuelling stops along the route where substantial snacks and drinks will be provided. We’re afraid not. The event organisers, Threshold, are unable to accommodate dogs. What happens if I fall or I am injured during the hike? On the day you will be given an emergency number to contact should you need any assistance and there will be roaming medics and trek-masters along the route. There will also be regular checkpoints where medical and event staff will provide support. We've answered the most common questions below. If you can't see your question, download our fundraising factsheet for a full list of FAQs. Even if you have signed up to several Mighty Hikes, we still ask you to raise a minimum of £250 for each event. As for any charity, organising these events costs money. 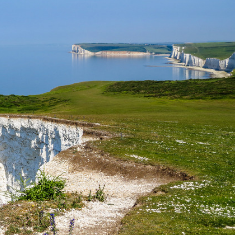 The £25 registration fee doesn't cover all the costs of putting on a fully-supported hiking series of this scale so we have to set a minimum fundraising amount. This ensures the costs of the event are covered, so the majority of the money fundraised is spent on our vital services to help people affected by cancer. Set up your Northumberland Coast Mighty Hike page on JustGiving today. Definitely! Once you’ve registered, keep a look out for your Fundraising Pack in the post which should arrive within three weeks. This includes a comprehensive fundraising guide with advice and ideas on how to reach your fundraising target, along with a sponsorship form and other resources. When you register you will be able to order your free Macmillan technical top which will arrive with your welcome pack. For your full recommended kit list download this factsheet. 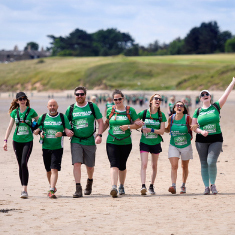 You can also call our Supporter Care Hub on 0300 1000 200 (Monday - Friday, 9am - 5pm) or email hiking@macmillan.org.uk for further information.